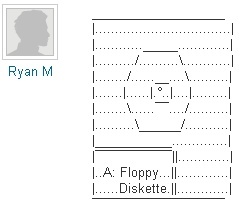 floppy disk drawing by ryan m. thanks ryan! we are totally freaked out about sleep. we are very rational and we don't like to approach any new endeavor without the benefit of professional analysis. so before proceeding with this torporific affair, we got in touch with dr. dozzy dreams (one-time pupil of the late and famed dr. nodd) who gave us a healthy slice of insight into the world beneath closed lids. SOFTWARE: first, let's cover a little ground in-respect-to the dangers. what in your professional/academic/philosophic opinion is the most dangerous thing about sleeping? DOZZY: Not being able to wake up! SOFTWARE: that had not occurred to us. we shall not sleep. what will happen if we don't sleep for a day? SOFTWARE: hm. we are not altogether uncomfortable with that. but, supposing we were again to forego sleep on the following day; the cumulative days-without-sleeping being at that point 2? SOFTWARE: tired. tired eyes, tired ears, tired muscles... we have experience with "tired" and we think we can manage it - will we still be merely "tired" after a week without sleep? SOFTWARE: ah! exhausted is significantly more tired than tired, but the difference is only quantitative! we shall not sleep for a month, damn the consequences! what are the consequences? SOFTWARE: oh. maybe a catnap here and there, just to keep our health weekly and prevent weakness in our work. but we are troubled by dreams. if we are dreaming and we want to wake up, what then? any pro-tips from the sleep lab? DOZZY: I don't believe you can want to make yourself wake up while you're in a dream. Because you're too busy focusing ON THAT DREAM to worry about waking up. You'll wake up on your own time simply because it is ONLY A DREAM and it's not real. I'd say it's nothing to worry about when you wake up, but some dreams have lasting effects and it's actually quite amusing to me:) Also, i beg to differ that people say they can wake themselves up from a dream. There are levels of sleep to where you can dream. Once you are in deep sleep, you're officially dreaming. They have monitors to prove this. So for the 'light sleepers', don't pinch yourself too hard tonight when Freddy Kreuger is about to eat your face off. SOFTWARE: that's not really the dream we're worried about. we actually quite like that dream. in fact we'd like to have it more often. DOZZY: The only dreams I have ever had more than once have unfortunately been bad and scary ones. Maybe it is only those ones because they stick inside your head due to being frightened. Think really hard about it before you go to sleep. If there is a film or drink or something which may remind you of it before you sleep, use that-which may help. Dreams are mysterious things, I hope you get your dream back! SOFTWARE: thanks for the kind words. and thanks for taking time out of your busy schedule to talk with us - we know how much you enjoy your work.